With Toyota Corolla Xli launching its new Deep Blue Metallic body-color just a day back, Honda comes up with a new Model for its Honda Civic 2013. It seems like Honda was waiting in the bushes for the right time to come to make a comeback with a bang. And honestly, it did it good. This car is not only good, it is fabulous and to make things even sweeter, there are a lot of notable changes in this car from the previous model. Availability in more colors, powerful entertainment features, comfy climate controls and not to forget, amazing fuel economy are to name a few. From the first look of this car, you would love to feel every inch of it from the front to back. The new bolder and brighter front headlamps, the good old civic-style front grille with a little touch of chrome coatings, body color handles and side mirrors, sun screen on the top and remodeled tail lights on the back give it a classy look that you’d never want to take your eyes off it. Having a peep inside, you can expect to go bonkers for this car. It is not only spacious but also very luxurious. Though, you do expect the same from a luxury car, but the way civic 2013 does it, no one can. Most of the body dimensions are the same as of last model, however, the new civic seems a bit bigger and spacious. There is loads of legroom and head room for all the passengers and the drivers. The front and back seats can be folded to add more cargo space in the car going back to the trunk. Standard seats are made from quality fabric but if you are looking for a little more suppleness, you can go for all leather interior. Even the fabric seats are nothing less than comfort extravagance. The back seats can easily seat 3 midsized full adults or up to four skinny adults. The instrument panel is not only a set of indicators but also intelligent to keep the driver informed of his car. Cruise control, keyless entry and smart tech features of the new Honda civic are all standard. To make things hotter, this car chills unbeaten. Its superb climate control system manages the climate of the car within minutes. Apart from these, buyers can also go for high-tech navigation and multimedia features, extended warranties and other tweaks in the car to make their Honda civic their perfect drive. Keeping everything aside, one feature that beats all other cars is its unmatched fuel economy. 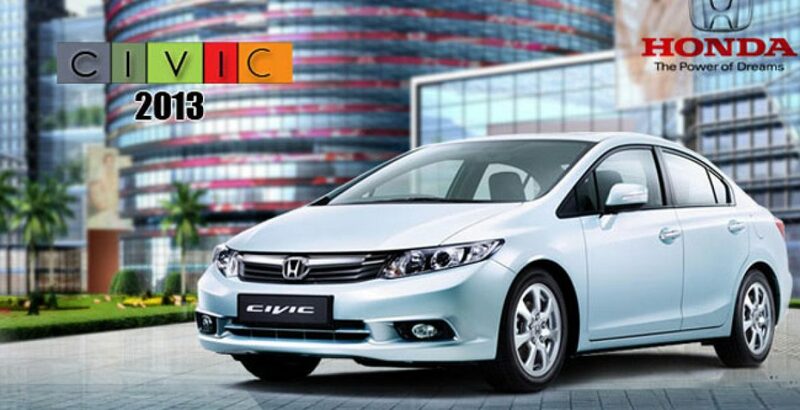 Civic 2013 is much improved from Honda Civic 2012 in terms of fuel economy and environment friendliness. So, it does not only make sure that you drive safe and with luxury but also within your budget.